Castrol Fork Oil allows air release and anti-fade performance under arduous conditions. Castrol 10w Mineral Motorcycle Fork Oil - 2 x 500 ml. Castrol Motorcycle Oil Features & Benefits. Resistance to high temperature vapour lock. 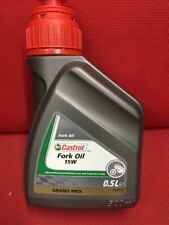 CASTROL MOTORBIKE FORK OIL 15W. 1 x 500ml Bottle of Castrol 10W Fork Oil. 1 x 500ml Bottle of Castrol 15W Fork Oil. Fork oil on a mineral oil-basis. Good absorption properties in all temperatures. Good capacity of air separation for a low foam formation. Protection against corrosion of the internal components. Castrol Fork oil. Advanced mineral based fluid designed to provide the. Castrol Fork Oil. High quality spares & parts at affordable prices. All other products are sourced from official UK distributors. Raw Power Motorcycles are main Importers for F.Fabbri,Tarozzi & Athena. Castrol Road/Off Road Car Fully Synthetic Fork/Suspension Oil/Fluid - 5W - 500ml. Condition is New. Dispatched with Royal Mail 1st Class. CASTROL FORK OIL. Viscosità SAE 10W. FOR MOTORCYCLE / SCOOTER FORKS. FORMAT FROM 0,5 LT - 500 ML. HIGH QUALITY FORK OIL. SIZE 0,5 LT - 500 ML. Capienza 500 mL. 100% SYNTHETIC. It has a highly refined base and a naturally high viscositiy index to provide superior anti-fade performance over a wide temperature range. 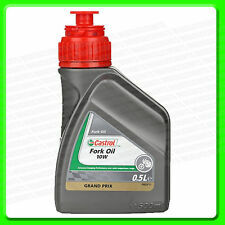 Castrol Fork oil x 3 500ml. 1.5 ltr in total. 10w grade. 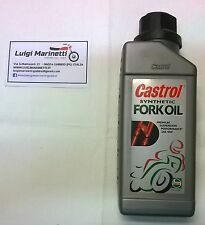 Castrol Fork Oil. Resistance to high temperature vapour lock. Outstanding lubricity giving smoother and safer braking. Castrol Fork Oil. All other products are sourced from official UK distributors. Raw Power Motorcycles are main Importers for F.Fabbri,Tarozzi & Athena. Outstanding lubricity giving smoother and safer braking. Castrol Fork Oil. Resistance to high temperature vapour lock. Protection against corrosion & wear, extending the life of the braking system. Outstanding lubricity giving smoother and safer braking.